Just because you’re planning to go live from a smartphone doesn’t mean the quality should look homemade. To create a smooth, high-quality video, there are a few quick upgrades you can make so you can create a beautiful live video anywhere, anytime. If you make only one investment, it should be on a stabilizing gimbal or tripod. A shaky video is extremely distracting and makes it difficult for viewers to watch and stay engaged with. Whether you’re wandering the conference floor or setting up in a home-studio, make sure you are set up for clear shots. Your phone probably sounds great when you’re making calls, but it is not as good at picking up the right sounds at a distance with ambient noise competing for attention. Getting a directional mic or even a lav mic you can pin to your speaker’s clothes is going to give you much clearer sound quality so viewers can focus on whats important in your live stream. You don’t have as many options with a smartphone to determine focus and depth of field. That makes it especially important to use lighting to pull your subject out from the background. Vloggers love the ring light for it’s ability to flatter a single subject, but an LED light panel will work great for bigger shots. 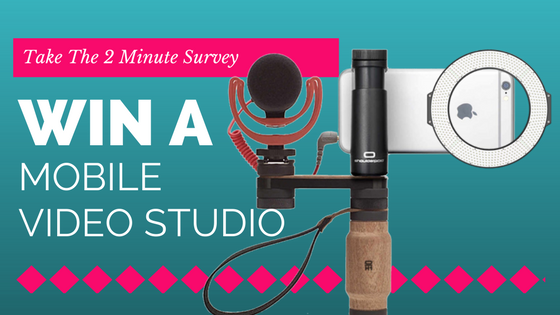 What does your mobile video rig include? Have some favorites you’d like to share? Let us know in the comments!